You know those weekends that fly by in an instant and you completely fail to take many photos? Well that was my weekend. I felt like I took so many more photos than I did which is preciously three. How did that happen? I guess I had a great weekend and made no time for photos. So let's get down to my weekend. Friday after work, we had time to burn until the girls were up from their naps, so we headed to Thai food for lunch which was really good. And then we still had time because the Thai place was on it that day, so we walked to a coffee shop and stopped at a cute little shop along the way to buy some cards for graduation and a birthday. By the time that was all done and we walked back to the car, it was time to go get the girls. So we picked them up and headed to Target. At Target we bought all the things or it seemed like we bought the store. We went home, unloaded everything and then I went to the grocery store to pick up some things to make dinner. I also made a quick stop at a local bakery for a little dessert surprise. While I was doing that, the girls were helping Rory out in the backyard. That evening we bathed the girls, played and I made dinner. We had dinner and then Rory took Walter for a walk while I got everything cleaned up. 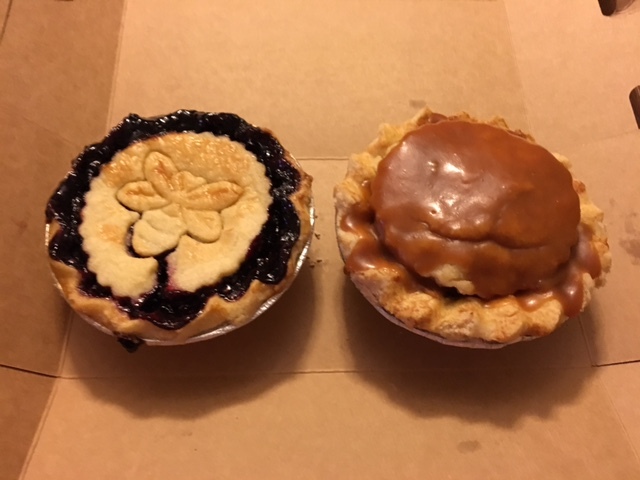 Once they were back, we put the last episode of Parenthood on and dined on cutie pies from Levi's Pies. It was the perfect way to end the Parenthood series and can I just say how much I loved that show? Seriously, one of my favorite shows ever. I loved the ending. Everything came together and I cried a ton. Sooooo good. Saturday morning we headed out to breakfast to Josef's where the girls pigged out on waffles, scones and even got us to get them a cookie for dessert. Then we headed to Costco to get things like pull ups, vodka (for moscow mules! ), paper towels and some tomato plants. Then we headed over to the outlet mall to get the girls some new shoes. Side note: it is crazy how different sizes the girls can be from shoe to shoe. The ones they were growing out of were size 7, so we tried size 8 in Vans and they were crazy big. Then we got them 7 1/2 for a bit of room to grow in them because 7 were getting close to the end. But when we got home we realized their other pair of Vans were size 7 and they have a lot of room. We put the girls down for a nap or so we thought. They played in their beds for an hour which sucked since we needed them to go to sleep on time since we had a grad party to attend at 2. We knew we would be late, but we ended up being an hour and a half late since the girls didn't nap til late. We congratulated the new college grad, had food, drinks and caught up with so many people. It was a really fun time. Plus the girls played with all of the kids when they were not dragging around their papa and grandma around. The cutest thing happened as we were leaving. The girls stopped twice to yell back at grandma to say, Bye grandma, lub you! We took the girls home, fed them dinner and played for a bit before calling it an evening for them. I took Walter out for a walk and it was the perfect temperature. Then we watched half an episode of Fargo before falling asleep. Sunday we went to our favorite spot, Stonehouse for breakfast since you can sit outside in a garden. We had amazing food and then the craziness came. We tried to drop Rory's car off to get a car wash and wax, but the line was so long right after they opened. They told him no waxes that day, but they could detail it. Well the girls and I waited for him to go through the wash so we could all run errands while they detailed it. We ended up sitting there for a half hour and the girls were getting really cranky. Finally, Rory got in the car and we went to Home Depot and to get my car washed at a super fast place. I didn't want to deal with those lines. Plus the girls got to go through the car wash and they HATED it. Ha. But they loved the Oreo treats we got them while they vacuumed and cleaned my car. We picked up Rory's car and headed to a new park and the girls went on the swings for a long time. They didn't want to do anything else. Crazy thing was there was 3 other sets of twins there at the time and I guess another set left just before we got there. They kept wanting to go higher and higher. It was getting hot and the girls had no sunscreen on so we cut it short and headed home for lunch and naps. Well naps went as well as they did the day before. They played for an hour in bed before falling asleep. But they slept for 2 hours. While they slept, I cleaned the bathrooms, kitchen floors and dusted. I also went grocery shopping and took Walter for a walk. Sutton got up first and helped Rory cut the rose bushes and then Avery got up and they played outside. I did some more cleaning in the house and then I made the girls dinner. After dinner, it was bath time and then we played for a bit until I had to start making pizzas for Rory and I. Homemade pizzas are the best. We put the girls down for bed, had pizza and then watched some mindless tv for the evening. We were exhausted, but had a great weekend. I told you you'd cry at the end of Parenthood! So good though! Those little pies looks delicious! :) I always feel like I walk out of Target with the entire store. I love the girls love to swing so much. Its still one of my favorite things to do. I still need to start watching Parenthood. Do you feel a little lost now its over? I hope this napping situation is not permanent, I know that will mess up a weekend! Ah Parenthood, seriously, one of my favorite shows ever! I loved how it ended. Sounds like a busy weekend! Can't wait for the recipe! Oh my goodness, wasn't Parenthood the absolute BEST?! I bawled my eyeballs out at the end. I didn't want it to end! Me too. I am so sad that it is over now too. Ugh. I'm so glad you had a nice weekend! I only took pictures on Saturday while we were playing outside. I was just too busy to take any more! I'm so glad you loved Parenthood. It was such a great show! We are having the same issue with shoes right now for Liam-he, too, is in a 7 and they just fit. 7 1/2, IF we can find them, are still too big! That is how I felt about the pictures. I am glad I got a few, but so glad I was able to enjoy my family. Let me know if you find any shoes that fit Liam and maybe they will work for girls too. Phew what a weekend!! I need to go back to Parenthood, that's going to start tonight since we have nothing we're really watching now. My Avery has been giving me the HARDEST time taking a nap, I fear we're near the end I want to cry!!!!!! Homemade pizza is the best! So in thinking about all the series my husband I have watched, Parenthood is definitely our favorite of all time! We actually watched every season in real time and my how I cried at the last episode. I was sad to see it go and who knows, someday I may watch the entire series again. Sounds like you had such a sweet world weekend! I wish I had watched it in real time, but I didn't find out about the show until I started Gilmore Girls which I watched late too. You should watch it again. What's not to love about swings? :) they are a favorite at our house too! Sounds like a great weekend!! That sounds like a lovely way to spend the weekend. Parenthood was a great show... if you loved that you'll love This is Us. I'm just jealous of all the eating & drinking! Moscow Mules for the win!